I have been an avid devourer of all things "Stephen King" for about 20 years now. Through some of his best books like The Stand (maybe my favorite book of all time) and It, to some of his lesser fare such as From a Buick 8 and Dolores Claiborne, I can say with 100 no-bullshitting that I have read every single Stephen King book ever! So, it shouldn't come as any surprise that I decided to pick up the Master of Horror's latest, Lisey's Story. When this book came out, I was SUPER-Skeptical. It was billed as "Stephen King's first love story". I wasn't exactly anxious to read a Harlequin Romance novel, but, being that it came from Mr. King, and the OCD part of my brain would probably read Mr. King's grocery list at this point, I decided to give this book a try. To make this short, I am not really digging it. First off, the good. It is NOT a love story. Not really. 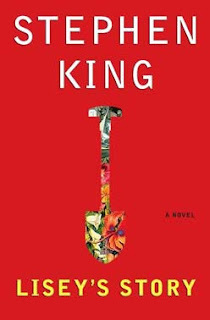 Although Lisey, a grieving widow and central character of the book, spends most of the book remembering times in her life with her dead husband, King manages to swerve the book back to familiar territory for him; Namely psychopathic killers, self-mutilation, and an alternate world. And that, in a nutshell, is part of this book's problem. It simply doesn't know what kind of book it should be. Supernatural Thriller, or Love Story? It's a little of both, and I for one aren't finding the mix to be working out too well. In short, if you are a King fan, as I am, then nothing I say about this will encourage or dissuade you from reading Lisey's Story. But if you are "on the fence", I'd say don't jump.